“Throughout my life, I have rarely seen someone as happy and satisfied as Miss-P”- Ryan Segelke. This week #StudentSpotlight Miss Peyton, our young fighter. Miss-P is an ambitious student who has been with HAT since it’s inception. I remember Miss-P’s first practice vividly to this day as she enchanted us all as a smiling, ambitious 6th grader. Miss Peyton with her Dad. I will never forget that one specific moment during one of our very challenging fitness sessions ran by our Lead Fitness Expert, Coach Michael Farrington. Ten minutes into the fitness portion of practice Miss-P was as white as a ghost, looked pale and seemed exhausted. One of our experts grew concerned and approached her to see if she needed a pause or a full stop break at which she said, “Nope, I’m good” and bravely continued with her fitness exercises. A brave little fighter she was, and eventually made it to the last drill of the fitness session where we were doing wall sits. Miss-P’s legs were shaking and tears were welling up in her eyes as she resolutely rejected the idea of quitting. When the session was over, it took nearly 15 minutes for her to recover from one of the toughest fitness sessions she had ever experienced at her young age. The entire staff was impressed by the will power, enthusiasm and passion Miss-P presented. On the other hand, we were also worried that the intense fitness session would scare her away from her future practice sessions. That is, until we all noticed her walking proudly to the car alongside her parents with a big smile on her face… she realized that she had just completed something immensely challenging which had made her better. She was profoundly satisfied… it was obvious, as she had accomplishment and satisfaction written all over her face. Her father, Pete [a former competitive rugby player], would later describe our program to others who were interested as “this place is not for sissies” … Miss-P surely is not a sissy! Miss-P continued to return day after day improving her game and her fitness to levels she had never experience before. She was ALWAYS completely focused on what would help her improve to eventually play college tennis, and not distracted by what would give her instant short-term results. This focus was highlighted during some of her first tournaments as a HAT player. Leading up to the tournament Miss-P had been working hard on improving her serve, and like most players who have worked on improvements in their game, she failed miserably the first few times she put them into action under the pressure of a tennis match. Actually, she could hardly make a serve in the box… yet she kept trying. She was swinging through her serve focusing on perfecting her motion confidently, with proper technique. A focus on perfection, which she knew would pay off in the future. That day, Miss-P had a choice, and she chose to think forward and be patient in her development. Which is, you must agree, very wise and quite rare for her age. Through her resiliency Miss-P worked out the kinks and went on to eventually winning three tournaments in a row! Her game was just thriving and things were looking up, way up! Throughout my life, I have rarely seen someone as happy and satisfied as Miss-P was at the end of her winning that first tournament. She has personally entrenched her parents and the entire HAT Community in a vibrating circle of satisfaction, pride and profound joy. Later, Miss-P began to become less confident in her movement and began to play with a little less balance than we were use to seeing from her. You see, one thing I failed to mention was that Miss-P, previous to our program, had fought another battle with the tissue in her brain. At age 5 she developed a brain tumor and had it successfully removed [the procedure, performed by the exceptional staff at The Children’s Hospital of Colorado is called a craniotomy and required Miss-P to endure 4 surgeries over 2 days]. Sadly, the malicious tumor had returned and Miss-P would have to once again return to the operating room. When Miss-P awoke from her second round of surgeries she noticed something was wrong. She had lost her coordination to all the muscles on the right side of her body. Furthermore, she had trouble eating, her vision was blurry and she couldn’t write. Miss-P couldn’t walk, run or jump much less play tennis. Luckily, in Miss-P’s heart and brain, these predicaments and constraints had a curious side effect… Miss-P challenged herself and she immediately went to work. She wholeheartedly welcomed her rigorous therapy at the Children’s Hospital and she worked hard. Yes, she did, even though the doctors warned her that her remarkable progress might eventually plateau. It was not surprising to see Miss-P returning to the tennis court. Except, things were much tougher this time around. All of the fundamentals, techniques and tactics she had learned she would have to start to relearn, without the expectation that she would ever become a great tennis player. She had hit rock bottom with her tennis when she tried out for her High School tennis team that year. Pre-surgery she would have been one of the top singles players for the team, and now to her surprise and disappointment she was on the bottom tier playing mainly Junior Varsity. This determination provided Miss-P the sour reality that her dream of playing college tennis was not in the cards. She was devastated. Miss-P even considered quitting her favorite sport for a while, taking prolonged breaks to try rowing, basketball, and other activities. However, she couldn’t get away from the feeling that she was missing out on all that tennis had given to her. She craved the day-to-day challenges and improvements where she was able to notice positive changes in her fitness and tennis skills. 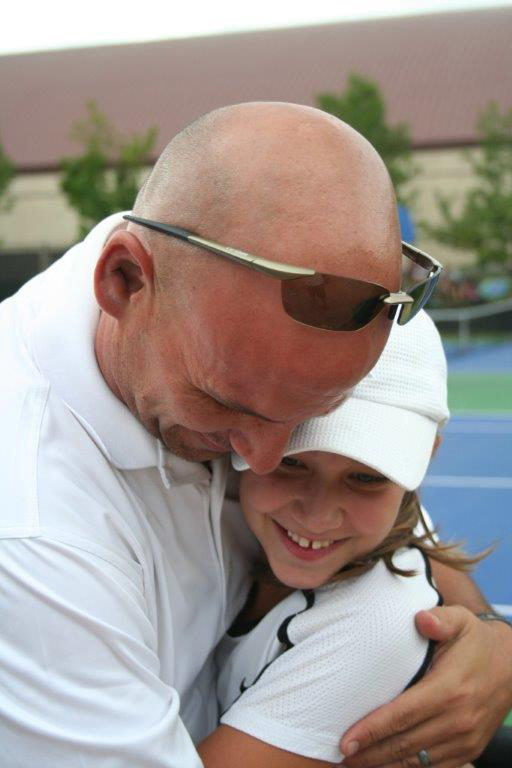 Thankfully, Peyton has returned to the court where she now plays 4-5 days a week in the same challenging program with elite junior tennis players from Colorado and all around the world with that basic goal and expectation that she will improve each day, one day at a time, slowly, passionately… patiently. Miss-P teaches us that this is not simply about tennis, but really it’s about all the lessons that tennis and any other competitive sport can teach us all in order to be highly successful in any endeavor. I, with 100% conviction, believe that Peyton, due to her ambition, passion, resiliency, and phenomenal character will be one of tomorrow’s prolific leaders. At HFAC, we say all the time to each and every student accepted into our program… you are whom you hang around, and we are tremendously honored to have the opportunity to be around Miss-P and such a wonderful community of students, parents, and coaches. Matthew picked up his first tennis racket at age seven. At the age of eight, he began spending a few hours each day at the local tennis rec. center. Recognizing Matthew’s increased interest and passion for the game, Mr. B (his father) and Mrs. B (his mom) wanted to expose Matthew to a more “professional” training environment, and that is when they found HAT! We want him to play tennis pro. He loves tennis. His life is tennis. While there are many caring parents who wish sports stardom for their children, there are really few who understand all of the hard work, investments, sacrifice, and drive that is required to succeed in any professional sport. In fact, Mr. B., had dreams of becoming an acrobat/artistic performer himself for the traveling circus in his birth nation of Mongolia. But, he was deterred by an unfortunate accident at age 4 that resulted in serious back injuries. Similarly to Mathew, Mr. B was passionately and determinedly focused on his circus acts, and after four years of purposeful preparation and dedicated training he managed to make his dream come true. Unfortunately, seven years into performing in his beloved circus Mr. B had to retire due to his ever-present back injury. However, as he is often sharing, “I had fun and lived those years wholeheartedly happy”. In 1999, Mr. B migrated to the United States. After leaving the circus it was hard for him to find work in Mongolia due to the uncertainty of the political climate. Drawn to the peaceful life in America, Mrs. B soon followed and joined Mr. B in 2001. They haven’t returned to Mongolia since – they have found America to be a good place… a home with many advantages and possibilities for the future of their children. Matthew came to love tennis… the game, the players, and everything connected to it. He puts in tremendous effort and works purposefully every day to become the best player that he can be. “It’s a good way to exercise. It makes me happy!” If you ask him who his favorite player is, he is likely to answer Roger Federer. “Federer is a strong hitter and has great footwork. I love his forehand.” Even at a young age, Matthew has set his sights very high. He wants to win many titles, such as Wimbledon and the French Open!